In our last post we covered the parts of a compass. Today we’ll look at the basics of using one. It seems many adventurers carry a compass, but when it comes to actually using one, not all are even semi-proficient. The basics are easy to learn and should be practiced before heading into the backcountry. In this article we’ll touch upon three basic tasks: taking a field bearing, taking a map bearing, and following a bearing in the field. We’ll also briefly talk about magnetic declination. A bearing is simply a direction of travel measured in degrees of angle against true north. For example, east has a bearing of 90 degrees. To take or measure a bearing in the field, point the compass in your intended direction of travel (usually at a distant landmark), rotate the compass housing until the orienting arrow is aligned with the north needle. The number at the index line is your bearing. To plot or follow a bearing in the field, once you have set your bearing angle, hold the compass level in front of you and rotate your body until the north needle is within the orienting arrow; this is called “boxing the needle”. As you travel, just keep the needle boxed. When doing this type of sight navigation, taking magnetic declination into consideration isn’t strictly necessary, but I highly recommend getting into the habit of calculating declination, or get an adjustable compass that you can set and forget at the beginning of your trip. 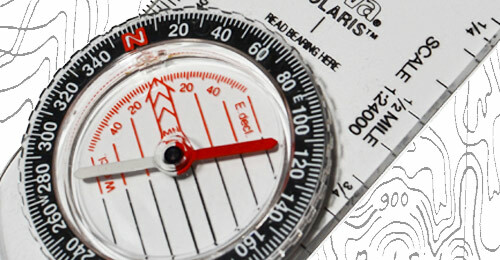 This will reduce the likelihood of mistakes when using a map and compass in combination. Magnetic declination is the difference between true north and magnetic north. It is measured in degrees of angle, using true north as a reference. Therefore a declination of 10 degrees east means that the magnetic needle is pointing 10 degrees to the east (right) of true north. To correct this, 10 degrees would be subtracted from your bearing (rotate the housing and dial clockwise). If the declination was 10 degrees west, 10 would be added to your bearing (rotate the housing and dial counter-clockwise). This is an important concept when using map and compass together – East is least (subtract), west is best (Add). If you’re only using a compass to take (measure) and follow (plot) a bearing in the field through sight, such as using a distant landmark for reference and walking to it, declination is irrelevant for practical purposes. However, if you want to measure a bearing on a map and plot it in the field, or vice versa, declination becomes very important. Consider that a 5 degree error will result in being off by about 90 metres for every kilometre (460 feet for every mile). The area I usually travel in has a magnetic declination of a bit more than 17 degrees east, add to this a user error of 2 to 3 degrees, and after only 3 kilometres of travel I’m approximately a kilometre off course if I ignore declination. I strongly recommend getting a compass with an adjustable declination scale to reduce the risk of error. When you’re tired and it’s windy, raining, and dusk is a few hours away, mistakes are easy to make. Better still, don’t put yourself in that situation; practice and leave yourself plenty of time to get where you’re going. But I’ll say it again, get yourself a compass with an adjustable declination which can be set at the beginning of each trip. To measure a bearing on a map, the compass is used as a protractor and the magnetic needle is ignored altogether. Lay your compass on the map; place the edge of the base plate so that it intersects your location and destination. Make sure the direction of travel arrow is pointing toward your destination and not where you are. Now rotate the compass housing until the orienting arrow is pointing north on the map and the orienting lines are parallel with the north south lines on your map. The number at the index line is your bearing. To follow or plot this bearing in the field, adjust for declination (this is important), rotate yourself until the north needle is boxed, and off you go.